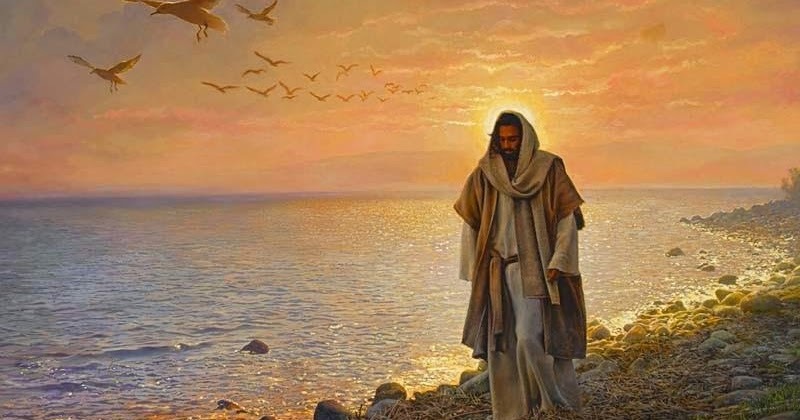 Cover image: “In the World, Not Of the World” by Greg Olsen. The Atonement of Christ required Him to experience what we his sisters and brothers experience so that “he may know according to the flesh how to succor his people according to their infirmities” (Alma 7:12). He knows what it feels like to be hungry, to be tempted, and to be rejected. After being filled with the Holy Ghost at His baptism, the Lord set out into the desert for a forty-day fast in order to prepare for His ministry (Luke 4:1-13). Here He tasted much of the pain of living in a world that is lonely and bleak—such a change from the premortal glory He had enjoyed. The forty days symbolized Israel’s forty-year sojourn in the wilderness, which in turn represents the life of each one of us here in mortality. Moses said to the Israelites, “Remember all the way which the Lord thy God led thee these forty years in the wilderness, so that he might humble you and test you to know what was in your heart, whether or not you would keep his commands. He humbled thee, and suffered thee by hunger, and fed thee with manna . . . that he might make thee know that man doth not live by bread only, but by every word that proceedeth out of the mouth of the Lord doth man live” (Deut. 8:2-3). Every one of us is tested in much the same way. We are humbled by mortality. We discover what we are made of. The Lord sends us here to “prove” us, to “know what is in [our] hearts, whether or not [we] would keep his commands” (see also Abraham 3:25). One of the tests we must face is hunger. Many suffer physical hunger, others suffer spiritual hunger of all kinds. “We can never give up longing and wishing while we are still alive,” says the novelist George Eliot. “We must hunger.” Many are hungry for answers or love or meaning in our lives. Spiritual hunger is a condition of mortality, the result of our separation from God, and only He can satisfy that hunger. Of course, this is the answer the fasting Jesus gave when Satan tempted Him to turn stones into bread. Jesus wasn’t there to feed Himself but to feed us, which He miraculously does with the multitude later in his ministry. More importantly, He also feeds us spiritually: “I am the bread of life: he that cometh to me shall never hunger” (John 6:35). In the wilderness, Satan continued to tempt Jesus with other mortal enticements: wealth and worldly ambition. The great irony here is that the Son of God is already the possessor of all things (see John 16:15), so Satan’s offers are meaningless. Of course, Satan also tempts us in the same way: everyone at one time or another experiences hunger for worldly things—ease, luxury, recognition, to have every want satisfied. Ironically, again, we are also heirs of the same promise made to the Savior: “All that my Father hath shall be given unto [us]” if we are faithful to our covenants (see D&C 84:38). But we must be tried first, just as Israel was tried forty years and Jesus was tried forty days. If we successfully resist Satan, he will “depart from us for a season” (Luke 4:13). He will be back, but the same discipline will work every time: “Submit yourselves to God. Resist the devil, and he will flee from you” (Jas. 4:7). “The Spirit of the Lord is upon me, because he hath anointed me to preach the gospel to the poor; he hath sent me to heal the brokenhearted, to preach deliverance to the captives, and recovering of sight to the blind, to set at liberty them that are bruised, to preach the acceptable year of the Lord. With this reading from Isaiah, Jesus made it clear to His hearers that He was the promised Messiah. For centuries, these passages from Isaiah (42:1-7) had been considered prophecy of a future Savior. In His subsequent ministry, He fulfilled the prophecy in every detail, as Luke chapter 5 confirms. He came to lift from us every painful condition of mortal life—poverty, broken hearts, enslavement, and blindness. Because He wants us to follow Him and do as He did, this same mission applies to each of us in our own sphere. We too can preach the gospel, lift the brokenhearted, help those who are trapped in addictions or other difficulties, and bring light into the lives of the blind—whether physically or spiritually. These things are our work as well. As signs of His salvific calling, Jesus went about doing miracles of healing (see Isa. 35:5-6). The cleansing of the leper (5:12-14) and the curing of the palsied man (5:17-25) are typical of his power to heal. That power is no less available to us today through His priesthood, and many physical ailments are miraculously healed or eased by that authority. The miracles Jesus performed were tokens of His calling. They were intended as testimony that He was indeed who He said He was—the Savior of the World. More than that, though, His healing miracles are outward indications of an inner spiritual reality: The healing Jesus Christ brings to our souls. Later in the book of Luke (17:12-19), Jesus heals ten lepers, but only one of them returns to thank him. Elder Merrill J. Bateman points out, “The grateful leper was healed inside as well as on the outside. That day nine lepers were healed skin deep, but only one had the faith to be made whole. The tenth leper was changed eternally by faith in the Savior and the healing power of his atonement.” (“The Power to Heal from Within,” General Conference Address, April 1995). Christ grants physical healing only if it concords with His plan for us, but spiritual healing—the “healing inside”—is always available to us if we come to Him for it. He notices us all and knows exactly how to “succor” us—to support us, heal us, ease or even lift our burdens by the power of His Atonement. No one is outside the bounds of His redeeming care. Elder Robert C. Gay asks, “Can you imagine our Savior letting you and your burdens go unnoticed by Him? The Savior looked upon the Samaritan, the adulterer, the tax collector, the leper, the mentally ill, and the sinner with the same eyes. All were children of His Father. All were redeemable.” (“Taking Upon Ourselves the Name of Jesus Christ,” General Conference Address, October 2018). Nobody in the time of our Lord was more wretched than “the man full of leprosy.” Under the law of Moses his ailment was considered “unclean” both physically and ceremonially. But when the man came to Jesus and said, “Lord, if thou wilt, thou canst make me clean,” in one of the tenderest passages of the Bible, the Lord “put forth his hand and touched him”—a gesture that would have been condemned by the world around Him as the grossest defilement. Nobody ever touched a leper. But Jesus did. We can all go to Him and ask, “Will you make me clean?” His response? “I will: Be thou clean.” And just as immediately as the leprosy left that wretched sufferer of old, our pains and sins can depart from us under the touch of that divine hand. There is such a growing desperation in the world for that healing and cleansing that Christ offers to all. And there are so many substitutes to tantalize and distract us in the search for peace and the calming of the storms that beset us. Faith in Christ, coupled with the sure knowledge of our eternal relationship with our Heavenly Father, provide the only sure pathway in this mortal world.